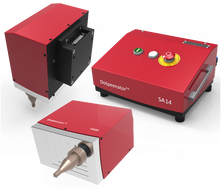 Dotpeenator™ SA14, mainly exported to many Europen and Middle-Eastern Countries, does not require a PC for controlling. Instead, that desk-top model does include a linux based mini computer with a 7" touch screen, many interface tools for communication and a user-friendly, easy-to-use Dotpeenator vr7 software. Dotpeenator SA14 is a stand- alone, desk-top, and most robust model with its weight of 55kgs. It is a must-have tool for marking even tiniest characters less than 0.5mm in height on your work pieces. 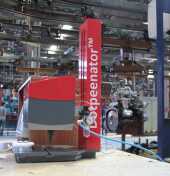 For more details on a Dotpeenator SA14 Dot Peen Marking Machine, please click the following link. Dotpeenator™ Trolley is manufactured from steel and coated by electrostatic paint. It is designed completeley to mobilize Dotpeenator PR94 & PR144 hand-held dot peen marking machines and their control units on its two inflated tires on factory ground. The design of that trolley cart enables the operators to easily move the marking machines in very short time to the intended point where the marking operation is needed. The trolley cart includes a drawer that contains a wireless mouse and a keyboard you may need to use on the spot to program the controller of dot peen marking machine, power cable, steel shielded signal cable, power cable, pneumatic house and a spring stick mounted on top of it, which holds the steel shielded signal cable off the floor against any possible damages. PR94 is a hand-held dot peen marking machine with a marking field 90X40mm that specifically designed to mark immovable big work pieces on the spot. The small structure of a PR94 dot peen marking machine is light in weight and fits in confined spaces. There are many types of peen assemblies that are mounted to the PR94. The height of the Z axis of a PR94 dot peen marking machine can be easily adjusted by specifically designed lift nuts. It is also equipped with a led light for the illumination of marking areas. Compared to its competitors in its class, PR94 has a very strengthful construction so much as to use our heavy duty peen kits for deep marking applications that are mostly required if the marked parts will be coated with rust protective paints, regular electrostatic paints and galvanize aftermaths. PR94 and the other PR series hand-held units have our designed optic limit switches, micro linear guides, and very strengthful aluminum construction. The additional aluminum second handle on the top of the marking head is the one you can even lean on. For you to see our powerful marking machines in operation, please contact our agents in your locations and ask for a demonstration. All our products have passed LV and EMC tests, have CE Self Declarations, Technical Files, Detailed Operator Manuals, Software User Manuals. For more detail please follow the below link. It is designed considering the needs for longer and bigger such contents as chassis numbers to mark. 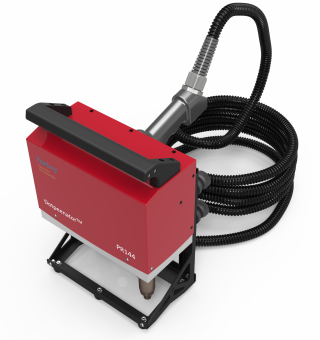 The deep marking capability of Dotpeenator PR144 pneumatic hand-held dot peen marking machine does not allow the marking results to be coated by paint or after a galvanizing bath. The PR144 models are used along with both a Dotpeenator™ CO9 Controller or a Dotpeenator™ SA14 Controller through a specially shielded wiring harness. 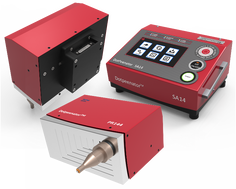 The PR144 runs its peen/cartridge kits pneumatically thereby creating more deeper marking results. Its investors are basically from the sectors of steel construction, ship building, heavy and large castings, spool pipe construction, automotive chassis building, etc. For more details, please click on the following link. 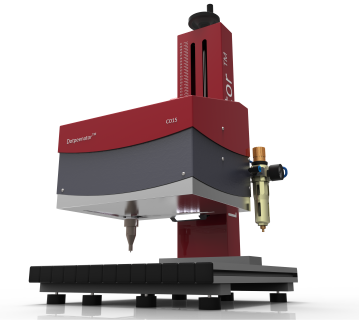 With its weight more than 55kgs, it is the most robust marking system of its kind. The marking field of that desk top, linear-guided marking machine is 160X110mm. The marking system equipped with either manual or automatic Z axis can mark work pieces up to 45cm length. The system that requires a computer is the most cost effective machine within its range. Dotpeenator INT144 is designed for marking while communicating with other control units, computers and PLC's in any automation lines via RS232. The marking area of this integrable dot peen marking machine is 140 by 40mm. For instance; any parametric values ​​defined as variables in a data matrix code could be replaced by any new incoming data sent by those external devices. Very versatile interface of the SA14 controller and its Dotpeenator DP7 Software meet all your automation needs. Dotpeenator INT94 with a marking area of 90X40mm is an integrable dot peen marking machine that is equipped with a variety of peen/cartridge kits, thus marking either deep or superficially,in dot or line form any content at the height from 0.5mm to 90mm. This marking machine has 55HRC-hardened micro guide ways in all axes that enable us to mark with an accuracy of 0.01mm, communicating with all computers or external controllers of any automation lines. This marking machine can be used either by Dotpeenator CO9 or by Dotpeenator SA14 Controller and does not require any periodical maintenance. The electrical peen/cartridge assembly running via magnetic field effect allows the marking operations to be performed where no air is available by replacing the pneumatic marking peen/cartridge assembly. The Dotpeenator CO9E Electric Dot Peen Marking Machine has all the software and mechanical features of our pneumatic CO9 model with the exception of the peen/cartridge set. The CO9E with 170x120MM marking area is suitable for working in the office environment too. This very special desktop model will be marking your name tags, tools, metal and plastic work pieces up to 42cm in height. Mark your design of logo, serial numbers, 2D data Matrix Codes, Date Codes, etc. 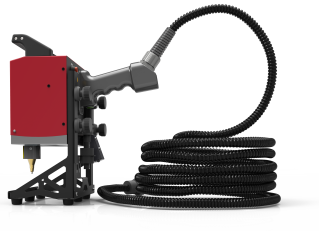 PR94E is our electric mobile marking machine which we have developed as an alternative to our PR94 pneumatic pin marking machine equipped with our pneumatic pin/cartridge tools that have many different functions(Please see the pneumatic peen functions). Our electric model is the one that is capable of working without the need for air. In general, our PR94E micro-linear guided models are easily adjusted to the marking fields of the work pieces by adjusting the height of the lift assembly of the hand-held marking machine, has our own design electronic optical limit switches that do not include the disadvantages of the mechanical and proximity sensors, the aluminium grips processed in our machining centers, which do not damage the cables due to leaning on, a LED Illumination kit for the marking-area , a kit of stainless steel protective covers for linear guide, 2 different control units to chose from, another heavy-duty handle for the second hand, and many other advantageous & robust features. We have classified, designed, developed and tested 6 types of dot peen tools for every requirement of our customers over the years. Basically, we have 3 specific range of dot peen tools; electrical, pneumatic one tolerating uneven or nonflat surfaces, the other pneumatic one for even surfaces with scribing-like marking results. We do not use aluminum housings. Instead, we use specific steel resisting corrosion, abrasion for longer life span. We also coat our dot peen cartridges with Nickel after testing them for their intended precision. Our standard peens are 83HRC in hardness as opposed to the 63 HRC ones of the major suppliers. That's why our peens last longer than the mentioned ones. 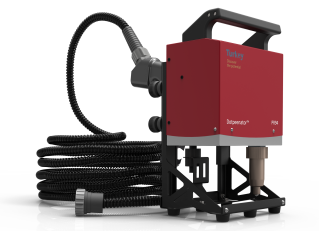 Our computer-operated CO15 model dot-pin marking machine has the same specifications except for the making area of 205X105mm that is larger than CO9. This model will meet the needs for larger marking area that is required for machine control panels, large name tags etc. The work table is made of Aluminum SIGMA PROFILE. In our standard model, Z-axis height can be adjusted with a hand wheel. This product can be fitted with an optional Programmable Z-Axis, a Rotary Axis or an X / Y-Axis.